I'm checking this, with the seller, as it may be a mistake, and/or correction from elsewhere (ie another description). We are aware of at least one vase, frequently appearing as Sklo Union, which is also known to carry the Fidenza mark. Thanks, I've got one of those Fidenza vases someware. I just came across it while I was looking for orange coloured vases in the Italian section. I was very surprised to find that the ebay listing had a description of an Italy mark though. - marked Italy on base. That's the link that I posted. Small world. Just bought 2 of the vases this morning - nothing written on the bottom - and already had 2 of the tumblers. Went onto ebay to see what a "Mesi" tumbler looked like...........and found this in the completed 300074375835 which is not like mine. Luckily someone had a live listing as well and they are the same which is great as I now have names for 4 more bits. Would you be so kind as to post a link to an image of your tumblers, please? I have not yet pinned these tumblers down. The contemporary images of both the vases, and dessert set in the "candle-wax" pattern, do not show a matching range of tumblers. Leave me with it....... I may have more to add at the end of the month. Being able to hold both the vase and the tumbler I can say 99% certain they are from very different places. 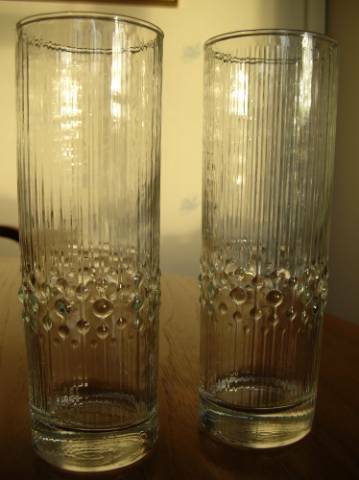 I thought the tumblers would be someone like Iittala, so I was unsurprised to see these on ebay 220078162918. I'm going to email the seller and see if I can get his source of information on them. Is it the vase you're still checking? I think your website is fab and have bookmarked it for a future visit when I have a bit more time to browse. Yesterday, I bought a vase that looked very like a Sklo Union 'candle wax' vase, but had 'Italy' marked on the base - well hidden on the inside rim, so that I only found it by feel. Does anyone know who might have made these? Is this another Fidenza copy? Are the copies always marked? Also, I note that the base on my vase is exactly the same as the one pictured on Della's vases here - no grinding and with that strange double rim. Could hers be Italian, too? I have never actually studied the bases of mine, until you posted this thread. I actually have 4 of these vases and have just had them all up-side-down on the table. None of them have the word Italy anywhere, but, 2 of the bases are decidedly hollow and 2 of them are hollow towards the rim, raising slighlty towards the centre. You can actually see the concavity through the side of the vases of the 2 with the hollow dip, but not on the other 2. I am now very curious. If I know, I'll comment. If I think I know, I'll have a go. If I have no idea, I'll just keep quiet and learn from others, so the next time I'll know. Page created in 0.571 seconds with 28 queries.